The 70's were great for many things: hot tub parties, EST, disco. It was not so great for goldfish, or normal healthy food as we know it. 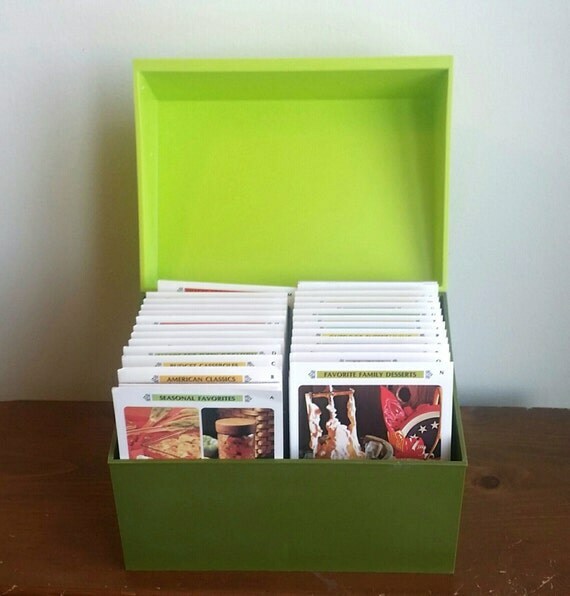 I picked up this 18-pound chartreuse box containing over 600 recipes at a thrift store by my house. As I shuffled through the cards, I found the vestigial organs of our gastronomic past. The Betty Crocker Recipe Card Library / Via General Mills, Inc.
...Or another dish filed under "Men's Favorites," featuring a little green army of brussel sprouts spying on a loaf of crusty hot bread ensconced in chrome. In the background, salt and pepper loom like a pair of nuclear cooling towers. Gelatinized vegetables and mayo-slathered salads may seem a little "un-Kosh" in today's gluten/dairy/tree nut/sugar -free culinary climate, but remember, this was the age of technocratic make-believe, the Cold War, the Bicentennial-era, sculpted coifs a'la Saturday Night Fever, and Ms. Betty Crocker was the woman who could "cordially" invite you over for a taste of it. Now let me be frank, never underestimate the power of the humble hot dog to help bring out your silly side. Once you've "mustard" the courage to get a little weird, tubed meat, especially when festooned with melted cheese and bacon, will bring out a better "you." Yes, a man first landed on the moon, but it was Betty Crocker who first put tiny yeast martians with gouty arms and jellybean antennae on a celestial orb of cherry Jell-O. As Carl Sagan once said, "If you want to make an apple pie from scratch, you must first create the universe." Blastoff into this recipe, which will blur the line between stars and carbs even more! Let your child fulfill his dreams of sneaking away with his own pair of open-faced buns, topped with sizzling strips of bacon, and pasties of gooey processed cheese. Listed under "Budget Casseroles," porcupine meat or any roadkill for that matter, can be very nutritious if beef ever proves to be too costly. Using an oven in this recipe will make this dish taste even more wholesome, especially when there are too many parasites to take out with tweezers. Wow, Shoulders! You seem quite cheery at your desk today. And isn't that yesterday's outfit? Inspired? Appalled? Kind of nostalgic for an era of far-out food you might have missed? Whether or not these enigmatic concoctions would ever make it to your table, don't tell me you'd refuse a platter of hot Cheese Dreams if you're ever plagued with a case of the drunchies. If we can take anything from this recipe collection to our kitchens today, it's the whimsy of food. We don't have to be expert chefs to make an exciting meal. Just have fun! Life's way too short not to. Make a sandwich, attach some pimento-stuffed olive slices for eyes, and call it a party!